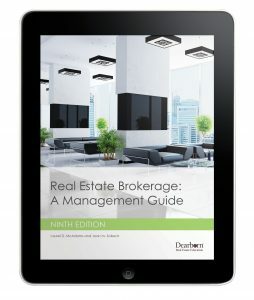 The most comprehensive real estate brokerage title available offers an applications-oriented approach to becoming more effective managers, leaders, and communicators. This latest edition of this textbook reflects innovation, which is most apparent in digital media and all the associated tactics and risks (including Internet security and identity theft), as well as the influence of generational diversity in contemporary business practices. This practical guide also highlights new trends in professional development, including formal mentoring and cross-training programs, and developments in civil procedures, including RESPA, antitrust, and employment law issues.